Photographer Nan Goldin might not be the first artist to come to mind in the context of streetwear. Yes, her images from the 1970s and ‘80s are eminently stylish and they glamorized the quite literally street-level lives of her subjects. But there’s an iciness and a certain introverted tragedy to the photos as well. 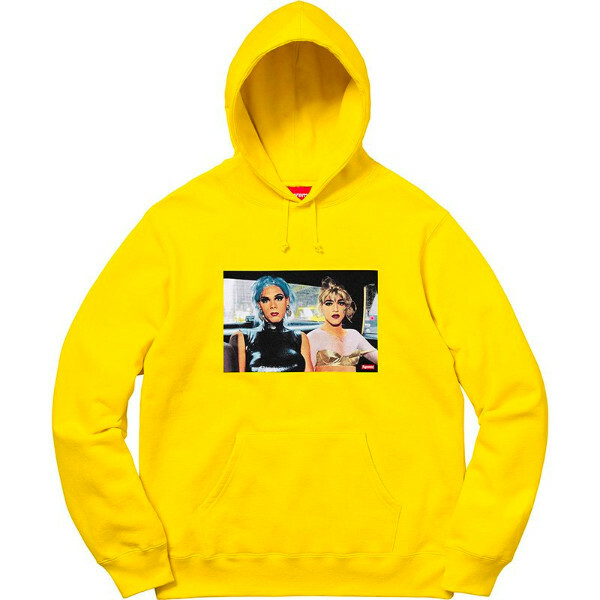 Which makes it surprising that they now appear on t-shirts and skateboard decks made by the Lower East Side fashion brand Supreme, working in collaboration with Goldin. Nan Goldin x Supreme, as collaborations are always styled, is a brilliant bit of cross-branding. Goldin gave quotes about how she wanted to expose a younger audience to her work, recalling a grittier New York that’s unavailable now. And Supreme gets to look highbrow by working with an icon who sometimes shoots for fashion brands like Bottega Veneta, pushing the boundaries of the brand’s usual image. Such creativity helped net Supreme a $1 billion valuation, with a recent investment from Carlyle Group. Art-world collaborations have become increasingly common, whether it’s with a brand or just a celebrity. In 2009, Takashi Murakami worked with the musician Pharrell to make a sculpture that mingled the artist’s signature anime aesthetics with more mundane objects including a sneaker that Pharrell produced (the wan work reportedly sold for $2 million). For any artist famous enough, and with a practice wide enough to accommodate commercial products, the temptation is unavoidable. In 2017 Jeff Koons collaborated with Louis Vuitton on a line of “Masters” bags inspired by his Gazing Ball series. The bags follow his strategies of Pop appropriation, labeling each printed bag with the artist’s name — Poussin, Gauguin, Monet — in metallic letters like they were luxury brand logos in themselves, which, in a way, they are. Lowbrow, high-speed streetwear brands pioneered the collaboration strategy in the ‘90s and 2000s. There was less at stake for them to drop their logo next to another company’s (unlike, say, Chanel) and they had to keep a young audience interested in whatever was coming next — Supreme does weekly “drops” in lieu of seasonal products. For its customers, Supreme x Nan Goldin or Supreme x North Face spices things up enough to make the largely iterative items desirable. Hermes producing a scarf with Hiroshi Sugimoto, which happened in 2012, isn’t so different. The collaboration fad suggests that artists and brands are increasingly willing to work together, and commercial products can be part of a critical artistic practice. But the combination works best when it’s organic, suitable for both the company and the creator. That suggests that curators are more important than ever, negotiating between both sides and making sure the fit is right. Sadly, we still haven’t seen too many contemporary artists cross-collaborate, leaving us yearning for something on the level of Koons x Hirst. Curator Klaus Biesenbach doesn’t seem too far from a Supreme drop of his own, though. Kyle Chayka is a freelance journalist and author in Brooklyn, contributing to publications including The New Republic, New York Times Magazine, and Bloomberg. He focuses on the ways technology has shifted cultural production and consumption. His first book, on minimalism, will be published by Bloomsbury.